Like most professional artists, commissions for clients form a large part of my work. These may take the form of illustrations for publishers, or personally commissioned oil paintings for private collectors. If you're thinking of commissioning a painting for yourself, read on - it's very simple and immensely satisfying. All my paintings are oil on canvas, designed to last, so if you order a painting from me you will receive something special, a work that you have helped to co-create, and which you can enjoy for the rest of your life before handing it on to some special family member or friend. So it's worth taking the time to get it right! First, decide what you want; what are you envisioning? If you aren't sure yet, please have a browse around my website and see if any of the images speak to you personally as this may give you some inspiration. I don't need lots of detail, and I am happy to work with you to understand what you want and to propose a way of achieving this, if you have a particular subject in mind. If you already have a good idea of what the size and subject of the painting should be, then you're ready to contact me for a quote. Each commission is individually quoted on my estimated time to completion and current art materials costs, and if you want to acquire the full copyright in the image as well, that value is also factored in to the quote. Size and complexity are obviously the main factors in pricing a quote, but I have a great deal of experience in this and once a quote is given, even if it takes me longer than expected, you will not be asked to pay any more. I always ask for a deposit to begin the work (this is non-returnable) and then you will be asked to pay the balance after you have approved the photograph of the finished piece. I have completed hundreds of commissions and have yet to have one refused at this stage, so if you are drawn to my style of painting you can feel confident that I will work with you to produce a unique piece you'll be delighted to own. The turn-round time for taking a commission through to completion and delivery is from 3 weeks to two months, depending on my workload at the time, and the size of the commission. 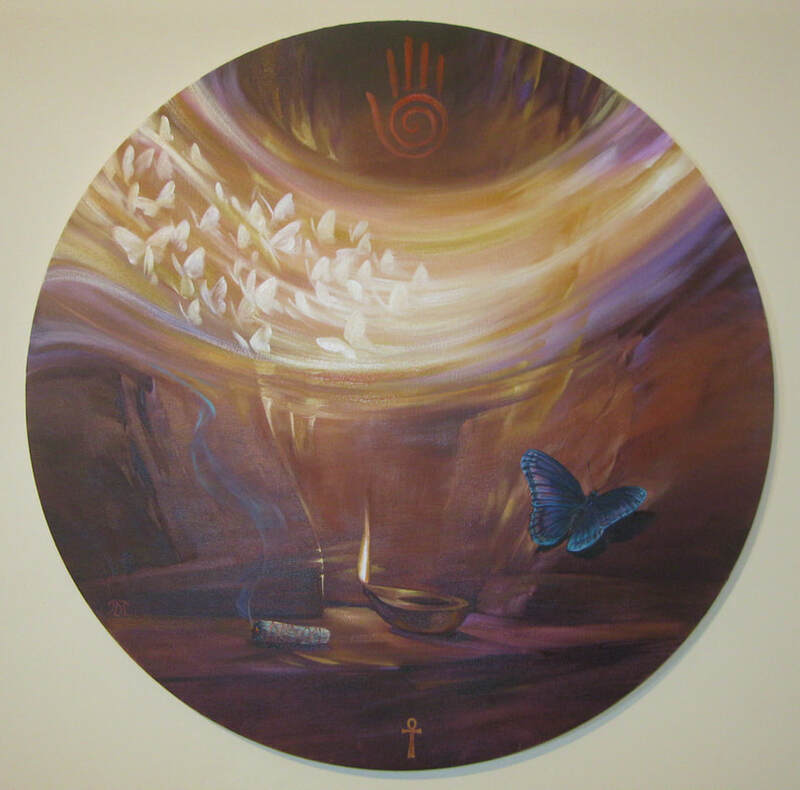 'Revelation' - oil on circular canvas 24 inches in diameter, for a client in Denmark. 'Roses All The Way' oil on box canvas 36 x 48 inches. 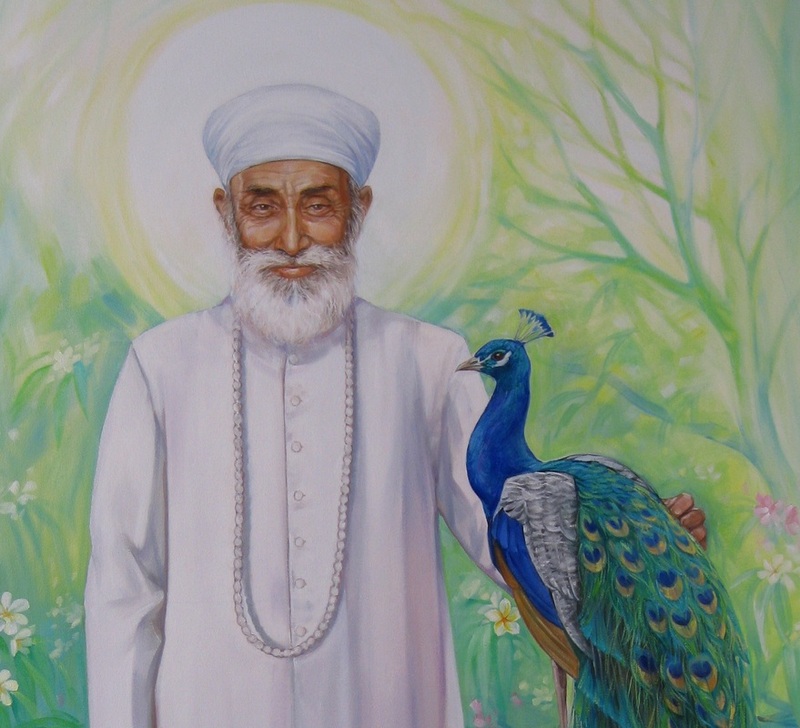 This posthumous portrait of His Holiness Satguru Guru Jagjit Singh Ji was commissioned by a client in Birmingham. It is 5 feet high, painted in oils on a tailor made stretched canvas. The image below shows the full painting. 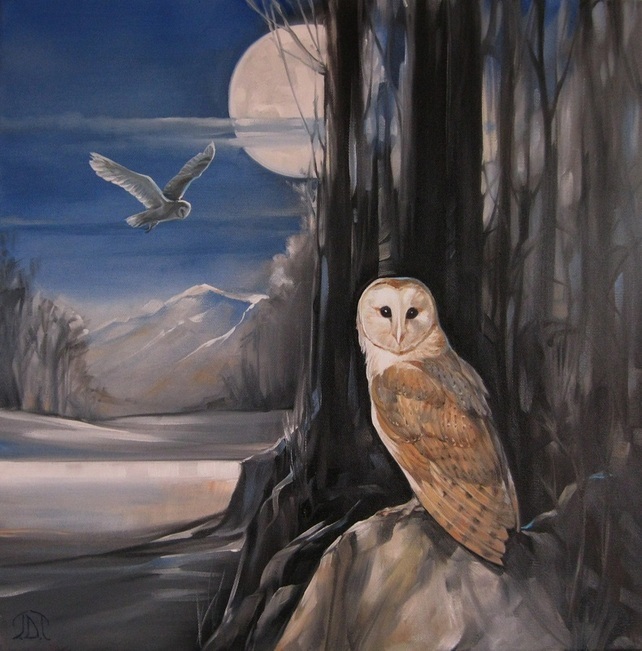 'Owl Moon' - a commission of barn owls in moonlight for a nature lover. Oil on canvas 20 x 20 inches.